A popular favourite from the range, now available as sugar free. This classic flavour is perfect in a coffee and would be a great addition to any menu. This is a great option for those who like sugar in their coffee but would like to try something new. A classic creamy and buttery flavour with a hint of vanilla creates a delicious taste to any coffee. We are pleased that now even more customers can enjoy this caramel experience as the sugar free option appeals to such a wide audience. This zero calorie, sugar free syrup allows you will expand your menu, allowing you to create a ‘skinny’ option, which is becoming higher and higher in demand. This product is sweetened with Splenda, a sucralose-based natural tasting sweetener which ads zero calories, zero sugar and zero fat to your recipes. Unlike a lot of other sweetener alternatives on the market, the taste of this sugar free syrup is just as good as the real thing and there is no unpleasant after taste. 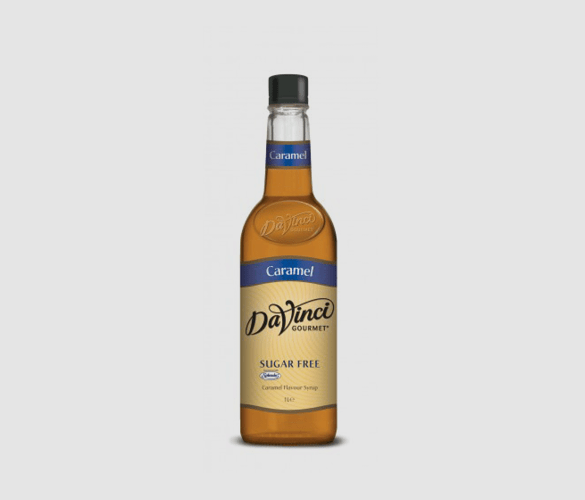 What are the Benefits of a Sugar Free Caramel Syrup? Our sugar free syrups allow you to offer flavoured hot and cold drinks without the added sugar, fat and calories. Theses sugar free syrups can be added to a dietary specific menu as a diabetic friendly option, or to your main menu as a great tasting, low calorie drink. This recipe is super easy, quick and delicious. We have tried it ourselves and we can’t wait to make it again! Pour into a glass, add some whipped cream and syrup and enjoy! Great size and much better than supermarket sugar rich alternatives. Great price as well. A nice background flavour when used in small quantities.